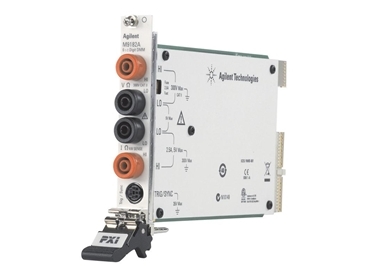 Agilent Technologies introduces two new digital multimeters (DMMs) to complement its growing family of PXI products. With applications in aerospace, defence, electronic manufacturing and automotive industries, the new 6.5-digit PXI digital multimeters offer high measurement speeds along with excellent accuracy and stability, providing an alternative to test engineers when designing their mission-critical PXI test systems. The two digital multimeters include M9182A 6.5-digit DMM and M9183A 6.5-digit enhanced-performance DMM. Each DMM ships with a full suite of software to enable easy system integration regardless of the software environment that end-users have on their PCs. An intuitive software front panel enables easy DMM set-up, measurement and system troubleshooting without programming. The DMMs include IVI-COM, IVI-C, and LabVIEW G-drivers that are compatible with C++, Visual Basic, NI LabVIEW and many other PC software environments.